Box Text: WELCOME TO THE MADHOUSE! Descend into the core of the criminally insane as The Joker launches his most diabolical plot ever. 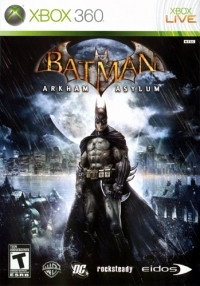 The inmates of Arkham Asylum have been set free - and it's up to Batman to bring order to the chaos and take back the asylum. Explore the depths of this never-before-seen island as you experience the darkest journey of Batman's life. 08-06-2012 mkarasch Box Text WELCOME TO THE MADHOUSE! 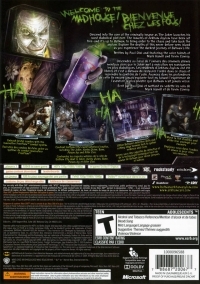 Descend into the core of the criminally insane as The Joker launches his most diabolical plot ever. 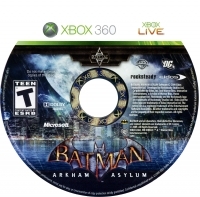 The inmates of Arkham Asylum have been set free - and it's up to Batman to bring order to the chaos and take back the asylum. Explore the depths of this never-before-seen island as you experience the darkest journey of Batman's life. Written by Paul Dini and featuring the voice talents of Mark Hamill and Kevin Conroy.